My first ever HAED … finished!! Anyhoo, one day I’ll download the software again to re-make the video and I’ll also add the rest of the photos in the process – it’s so much fun to see the project take shape colour by colour (when I remembered to take the photo anyway). Anne S • This entry was posted in Finishes, HAED, Uncategorized. Bookmark the permalink. It’s so nice to finally see the finished project in all its glory. I think it’s beautiful. Great work. Gorgeous! Congrats on your finish! Wow, a finished HAED! They are so rare LOL. Usually all you see are blocks of the top left corner. 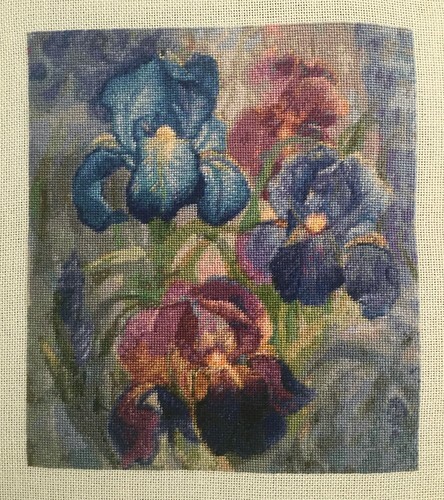 This is a beautiful design and you’ve stitched it really quickly too. Wow, I’m so impressed! I just can’t bring myself to start those dense stitching projects, lol! Kudos to you,Anne! Wow! That is a beautiful piece. Well done!